Now is the right time to play more ukulele, getting better at it, and protecting your fingers along the way. It’s now a raging trend with the younger generation, particularly on YouTube. While learning to play the ukulele is a little trickier than mastering a traditional guitar. The good news is there are a lot of guides there that can help you learn become a better ukulele player without problems. You might have the dedication needed for your ukulele playing. Yet there are times when you might get sore from all the playing. It’s important to know why it hurts and what you can do about it. It’s also possible that you might not be playing the instrument in a proper way. Are you curious how you can play the ukulele in a better, less painful manner? Read on and find out more. If you’re right-handed, you need to use your dominant hand to strum your instrument. You might get tempted to use it for fretting since it does all the fancy things. But you need to understand that your strumming hand has the most importance. You might stumble and fumble with the chords here and there. It’s possible that no one might notice it, even when you hit a few fluffed notes. But if your strumming speed slows down or becomes faster, people will surely notice it more. Strumming is a fundamental aspect of playing a song using a ukulele. Its importance is such that the different genres of songs have more strumming patterns than chord patterns. When you need to assume the right posture to learn ukulele playing, put the instrument down for a bit. You should try putting your strumming hand in front of your body’s middle. It’s the place where your chest and stomach meet. Ball the hand up into a light fist in a way that the fingertips touch the palm. Make sure that it isn’t pressing into it, however. Make use of your index finger and point at your left shoulder and rest your thumb in between that finger’s first and second knuckle. This is important because it gives your fingers extra means of stability. This ensures that you make clearer sounds when strumming the ukulele. After assuming the right posture, pick up your ukulele. Position it in such a way that your index finger is right above the instrument’s G-string. It’s the area where your ukulele’s neck meets its body. The location stated above is the sweet spot. Each type of ukulele has their own spots where you can make the most out of the strumming sounds. For example, soprano ukuleles have the sweet spot where its body meets the neck. Larger ukuleles have different sweet spots. In most cases, the spot is the area between the sound hole and the end of their bodies. The best way to know is to experiment and see which one sounds best without straining you. If you find your fingers hurting due to your strumming, you might not be doing it properly. This way, you’re exposing yourself to various risks like carpal tunnel syndrome. To prevent this, the right method of strumming your ukulele is to keep it loose. Tightening it up makes your sounds seem robotic while tiring your fingers out much faster. Another good thing to follow is to use your wrist to strum rather than with the use of your arm. The up and down motion you do with your arm will make it more tiring for you quite fast. Move your wrist and ensure that your forearm does no other motions than rotating. There’s no need for you to strum wider than your instrument’s strings. It becomes more difficult for you to steady the rhythm and tire your fingers much faster. When strumming down, ensure that your nail will hit the string first. Your finger’s pad should hit it when strumming up. This is a well-balanced pattern between softer up-strum and forceful down-strums. When you’re playing the uke, you need to relax. This isn’t limited to your hands and arms. You need to relax your entire body. It can get a bit difficult since you might tense up without noticing while you concentrate on playing. This can make you feel more tired, and your fingers might hurt even more. To avoid this, you need to make a conscious effort to relax. Start with your arms and shoulders before you get back to strumming your instrument. It’s a common beginner mistake to press your fingers on the strings harder than needed. Try to play a note and check whether you’re pressing too hard. Check if you can try other techniques to ensure that you don’t put too much finger pressure. With practice, you can get better and more used to it. If the pain is worse, it might be better for you to increase the frequency of your practices. Do this while decreasing the time you spend for each practice session. A good reason behind your sore fingers is the fact that they aren’t used to bending and moving. Sometimes, it feels stiff when you start playing your ukulele. The simplest solution for this is to start doing some hand and finger exercises before starting. There are a lot of hand and finger exercises out there you can use. Doing these exercises on a regular basis can help strengthen them and make them more flexible. A lot of the more adept and professional players out there do it. You become more comfortable playing with the instrument as your fingers become more flexible. If you want to start going for other stringed instruments, you can use these too. Don’t underestimate the possible healing effects of doing some simple hand and finger stretches before and after strumming. Sometimes, it can take a long time to get the proper calluses to play the ukulele. It’s especially the case when you’re still starting to learn the basic chords. However, there is a way for you to get the right calluses to make the experience pain-free for you. What you need to do is to soak your fingertips in alcohol. This helps make the skin become drier and make the calluses form at a faster rate. Water can make the calluses weak, so make sure you get your fingers as dry is you can. This only applies when you’re still trying to form your calluses. After all, the more you play, the tougher they become. Before long, water can’t affect it anymore, so no more need to keep them dry all the time. 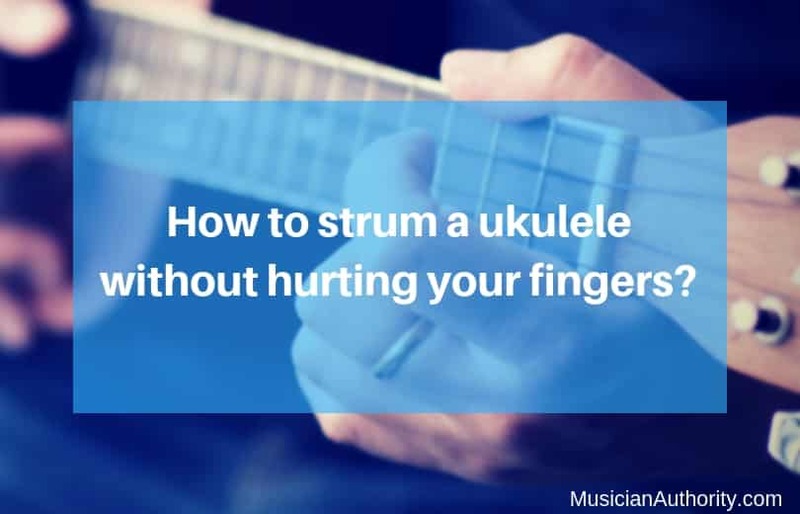 Beginners will always get blisters on their fingertips when they first learn to play the ukulele. These are sore and unappealing, but don’t try bursting or picking them. This is the foundation of your calluses and prevents pain as you play more instruments. You need to resist the urge. One of the best tips out there is to use a surgical spirit. Put your fingertips in it a few times during the day–10 minutes is often enough to help harden the skin. It might be tempting to apply plasters to your fingertips before playing. Avoid it because it’s going to make you perform worse as time passes by. It affects your learning process and makes you less accurate in placing the chord patterns. Most of the time, you get uncomfortable playing the ukulele. Your discomfort can be a good thing, so it’s okay to ignore it and continue practicing. A lot of chords can make your fingers uncomfortable when you’re just starting out. Once you start feeling immense pain, it’s time to stop. You might have the enthusiasm and spirit to persevere through pain, but it’s not a good idea. You don’t want to get serious problems such as tendinitis or some other crippling condition. Heed your body’s warnings. Superficial pain will go away after a short while. The serious, more severe ones will stay until you stop and take time off. Learn How to Play Ukulele Today! Strumming is one of the most basic things you need to learn when you start studying how to play the ukulele. With the right form and posture, you can get the expertise to play the songs you want without pain. Always know when to stop and relax — chronic pain is serious and can stop you from playing. Use these tips to know how to play without stressing your hands and fingers too much. Take your time and set your pace for your health. It’s okay to take breaks, but never stop practicing to maintain flexibility and skill. Did you enjoy this simple guide? If so, you might want to know how to pick the best ukulele strings. Read this related post to learn how to ensure your fingers won’t hurt while playing your favorite instrument.